The Sixth Annual Diversity Visionary Awards (DVA) is a celebration in May commemorating Asian Pacific American Heritage Month. The event will be held at South Coast Plaza at the Carousel Court on Saturday, May 20 from 11:00am 2:00pm. This event brings together, multi-cultural organizations, community sponsors, partners and supporters honoring and celebrating diversity and recognizing individuals for their work in diverse communities. The respective community leaders will be announced soon. South Coast Plaza, celebrating its 50th Anniversary this year, continues their support of the Diversity Visionary Awards and the partnered organizations for another successful and well-attended event. 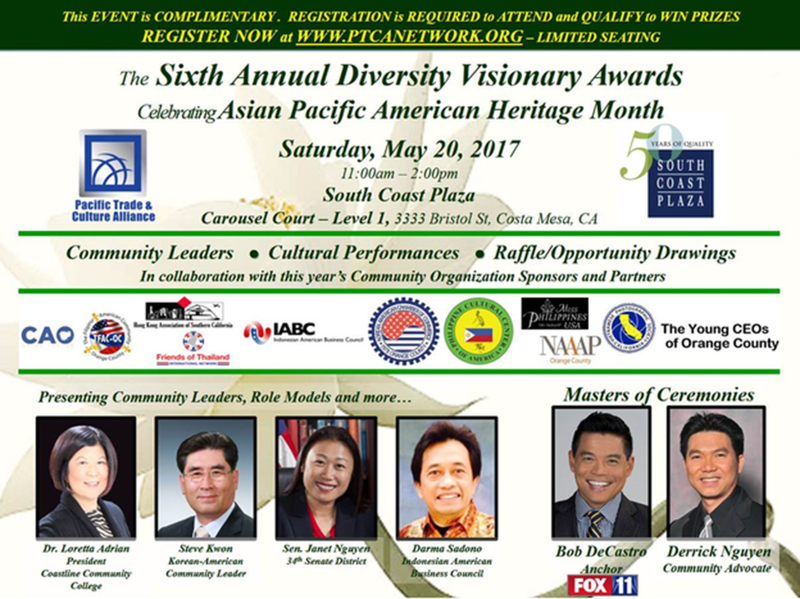 The Diversity Visionary Awards is recognized through the Pacific Trade and Culture Alliance (PTCA) as it spearheads this annual event together with this year's Community Sponsors and Partners: The Indonesian American Business Council (IABC), the Korean American Chamber of Commerce of Orange County (KACCOC), the Philippine Cultural Center of America, Inc. (PCCAI), the Friends of Thailand International Network(FOTIN), the Hong Kong Association of Southern California (HKASC), and the Young CEOs of Orange Country. Previous years have been sponsored by Integrity Escrow, Perfection Foods and UNITI Bank. This year's Community Partners are: The Cambodian Awareness Organization of UCI (CAO), The Filipino American Community of Orange County (TFAC-OC), The Friends of Thailand International Network (FOTIN), the Hong Kong Association of Southern California (HKASC), Miss Philippines USA, National Association of Asian American Professionals - Orange County, and the Vietnamese Photographic Society of California. This year’s Masters of Ceremonies are KTTV – Fox 11 Anchor Bob DeCastro, and Derrick Nguyen, Esq., a Community Advocate, who has also co-hosted previous DVA events. The program will also include cultural performances, raffle/opportunity drawings, and refreshments served by Quattro Caffé.